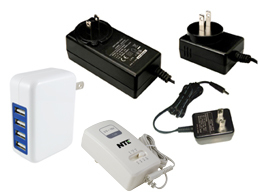 Regulated AC to DC Adapters available from NTE Electronics, Inc. These AC-DC switching power supplies constantly supply a steady, regulated voltage in any situation, as opposed to non-regulated AC to DC Adapters which have a tendency to vary widely in voltage. Available in 5V, 6V, 9V, 12V, 18V and 24V outputs and a variety of wattages from 2.5W to 72W, with output currents from 500mA to 6A. Now available are two Universal AC-DC regulated adapters. These Level VI Efficiency Standard Compliant power supplies are available in 1A (15W) and 2.5A (30W), have switchable, multi-voltge outputs ranging from 3V to 15V, and inclues 2 reversible polarity tips. In addition to our fixed output adapters, we're sure you will find the right device for your application. Inspect the device and look for any labels or symbols that indicate either the voltage or mAh/A, if not, check the user manual or do a quick Google search. AC or DC – as indicated by a symbol. Usually, all of this info is on the adapter sticker, remember you are always looking for the output V and mAh or A. Once you have the V and A determined, most appliances will have a circular connector with the inside hole carrying one pole and the outside carrying the other. The most common is center positive (+) connectors. There is also the less popular center negative (-) connector.